Kerala is the most popular honeymoon destination in India, particularly because of its romantic resorts on the beaches, backwaters and hill stations. Top ten honeymoon destinations in Kerala are Munnar Hill station, Kumarakom Backwaters, Alleppey Houseboats,Thekkady wildlife sanctuary, Koavalam Beach, Waynadu Hills, Marari Beach, Athirapally waterfalls, Vagamon Hills and Bekal Beach.Kerala honeymoon packages takes you on your romantic vacation through some of the unique and spectacular landscape that seduce the mind of the honeymooners and let them enjoy romantic time in solitude ambiance with full of romance, fun and joy.Kerala Honeymoon packages are the prefect was to celebrate once it a lifetime honeymoon. Kerala honeymoon package provides couples an opportunity to explore the misty landscape of Munnar, narrow backwater lanes of Alleppey, vast stretches of open beach in Kovalam and exotic flora and fauna in Periyar enjoying a romantic cruise over the man made lake situated amidst the Periyar sanctuary. 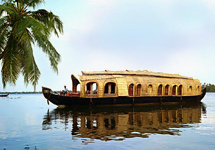 Kerala honeymoon package provides you with once in a lifetime opportunity to explore Kerala. Kerala honeymoon package are quite inexpensive and are the ideal gateway to enjoy romantic honeymoon vacations amidst the charming natural beauty, fascinating culture, warm hospitality and romantic ambiance . Tour programs as indicated in the itinerary. Welcome Drink on Arrival. Flower Decoration in the room. Spa & massage treatments as indicated in the itinerary ,Tea / Coffee Maker in the room. Special Honeymoon Cake & Badam Milk. Fruit Basket / Homemade Chocolate / Nuts & Dry Fruits. Cookies / Packaged Fruit Juice / Mineral water. FREE Internet usage up to 02 Hours. Surprise Gift at Checkout time.